$612.26 Vollrath 40791 Smooth Top & Bottom Panini Sandwich Grill 13-5/16" x 12-3/16"
The versatile Winco EPG-1C Electric Countertop Single Panini Press, 120V is perfect for a wide variety of tasks from making panini sandwiches to grilled vegetables or chicken. This premium quality panini press is designed with a ribbed cast iron surface that heats up quickly while its hinged balanced top plate accommodates different food thickness. Featuring an adjustable thermostat, you can easily regulate the temperature up to 570°F for heating various types of food. 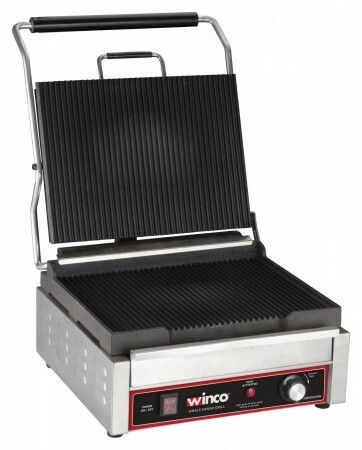 An indispensable addition to any high-volume food venue, this electric countertop panini press is made from highly durable stainless steel and comes with a removable crumb and grease tray for easy cleanup. Adjustable thermostat to 570° F.
Grill surface: 14" x 12"
Dimensions: 16.125" x 14.75" x 9.75"